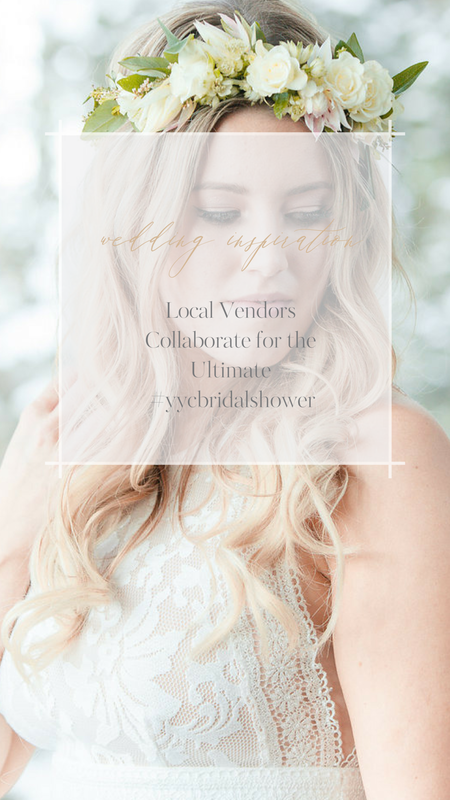 We are thrilled to announce that Jacqueline Rae has teamed up with some incredibly talented local vendors to launch an annual contest in the Calgary area, called #yycbridalshower! What’s it all about, you ask? Brides-to-be are eligible to enter the #yycbridalshower contest through our website platform for a chance to win their dream wedding shower, styled to perfection with all the indulgent extras. Southern Alberta has a stellar selection of wedding and event vendors and we’ve created an opportunity to showcase their product and skill in a fun and unique way! Our first contest winner and bride-to-be, Caitlin Kausche, was hosted at the stunning Azuridge Estate Hotel, nestled in the woods of the Rocky Mountain foothills about 20 minutes from Calgary. This retreat is seriously remarkable – offering private luxury, fine dining, and personalized attention for weddings and special events. Caitlin began the day with the royal treatment with hair and makeup styling by the talented Avenue Beauty, in addition to her incredible lash extensions by Brown Sugar Lash Artistry. Caitlin was even pampered with a skin session from Natasha Rae Skin and Nutrition before the big event and was outfitted with jewelry by Lacebrick Design. 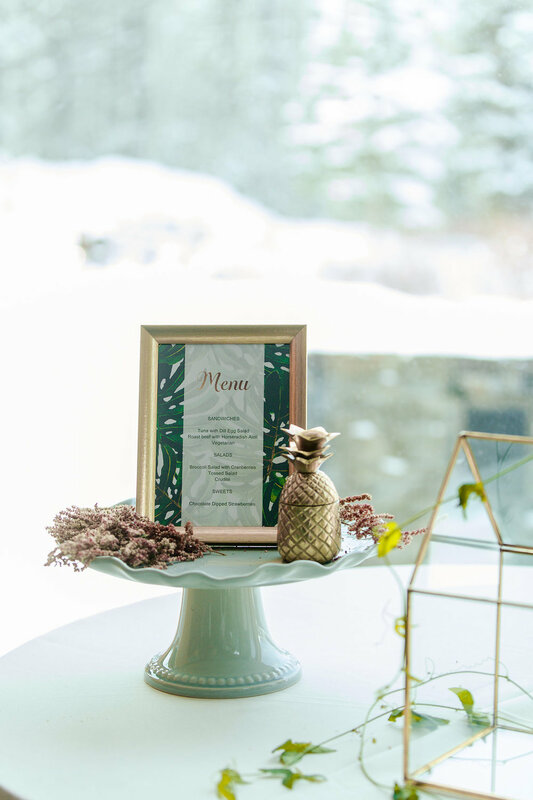 Styled by us at Jacqueline Rae, the party’s design was “Hawaiian Romance” which included an array of gold and green décor with glowing blush accents. The tropical three-tier cake by Lovingly Sweet was truly inspired – decorated with real flowers and greenery, it looked as gorgeous as it tasted. The cake was complemented by custom cookie favours, again playing into the Hawaiian theme with pink flamingos and golden pineapples. In addition to a stylish flower crown, Small Flower Floral Studio provided Caitlin with a variety of unique table arrangements as well as an exotic flowered wall hanging. The stationary suite was provided by the award-winning company, Lovesky Design and featured a tropical spread of invites, menu and place cards. Many of the finer touches were rented from Gathered Table Supply and Modern Luxe Rentals. With its unique selection of candleholders, easels, tables and cake stands, they made this shower shine like a diamond. And finally, the elegant still shots were captured by Lisa San Filippo of Moments Marketing Photography, who specializes in everything from food photography to portraits and events. The #yycbridalshower committee consists of Nicole from Lovingly Sweet, Kelly from Lovesky Designs and the team at Jacqueline Rae Weddings, Events & Interiors. We’re in the business of making dreams come true and we can’t wait to host the next winner’s perfect wedding shower!